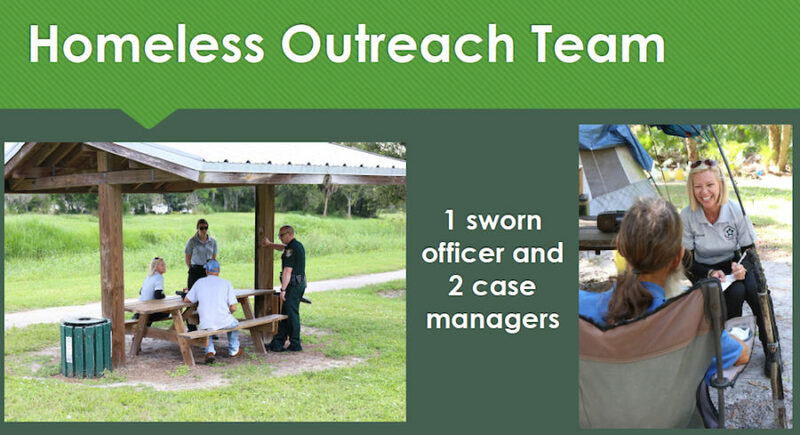 The Homeless Outreach Team (HOT) the Sarasota County Commission approved last year has “worked very well,” Sheriff Tom Knight told the board this week. However, given the size of Sarasota County and the number of homeless individuals estimated to be living in South County, he recommended that the County Commission consider arranging for facilities in South County. Commission Chair Charles Hines indicated a willingness for his board to discuss that option. After the commission approved a Quality of Life ordinance on Nov. 14, 2017, the commissioners agreed that the Sheriff’s Office should field a HOT program similar to the one underway in the city of Sarasota under the aegis of the Sarasota Police Department. Although the commissioners originally allocated $452,000 to the Sheriff’s Office for five people in a HOT program, Knight pointed out on Feb. 26, he decided to start off more slowly, with just a three-person team, two of whom are case managers. He wanted to make sure the program would achieve the goals the board had envisioned, he added. The Quality of Life Ordinance was drawn up to give homeless individuals violating county regulations the opportunity to cease doing so and accept an offer to move to an emergency shelter. There the person also would be able to receive assistance from service providers. As a last resort — only when someone refused any help and kept violating county regulations — would the person be arrested. Before approving the ordinance, commissioners talked of examples — especially in the Nokomis area — of homeless individuals and vagrants sleeping in county parks after the facilities closed for the day. As a result of the conservative start to the HOT program, Knight said on Feb. 26, he returned $142,000 to the county. The Sheriff’s Office formally launched the HOT team in June 2018, Knight noted. All of the members were with him that day in the Commission Chambers at the County Administration Center in downtown Sarasota, Knight added, including Bill Spitler, leader of the team. “These ladies and Bill have a wonderful way of engaging with these people,” Knight pointed out. A chart Knight showed the board on Feb. 26 said the HOT team had made 484 contacts with individuals from June 2018 through January of this year. 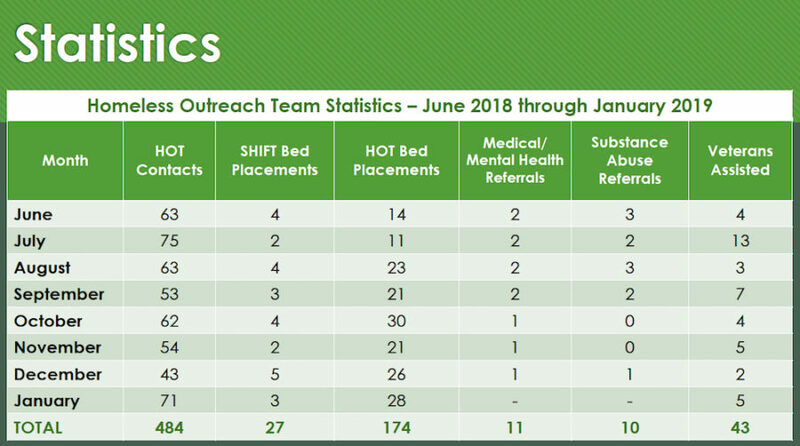 As a result, 27 people were placed in beds reserved for an earlier program of the Sheriff’s Office created to assist the homeless, Sheriff’s Housing Initiative Facilitating Transient Services (SHIFTS); 174 were transported to HOT beds the commission has funded; 43 veterans were helped; 11 individuals received medical and/or mental health referrals; and 10 accepted substance abuse referrals. Knight noted that he had left written accounts of some of the persons’ stories for the board members to review. “I think at the end of the day, we live in a society that wants to see data,” he continued. Therefore, as the commissioners begin work on their budget for the 2020 fiscal year, Knight said, he wanted them to consider both the strengths and weaknesses of the program. Having the beds available does increase the opportunity for homeless individuals to gain the assistance they need, Knight pointed out. In fact, he said, the beds the county pays for at the Salvation Army facility on 10thStreet in Sarasota stay filled. Because the county is so big geographically, Knight added, “The team moves around a lot. … Sometimes, it takes the team 45 to 60 minutes to get to a location” where an officer has made contact with a homeless person and needs the team to intervene. In the first six months of the program, Knight said, the team drove 22,000 miles. If the commission increased the personnel to five, he added, and it was able to partner with facilities in South County for beds, that would strengthen the program. If the commission chooses not to provide extra funding for the program in the 2020 fiscal year, Knight continued, he and his staff might limit the team operations to the area of the county from Clark Road north. 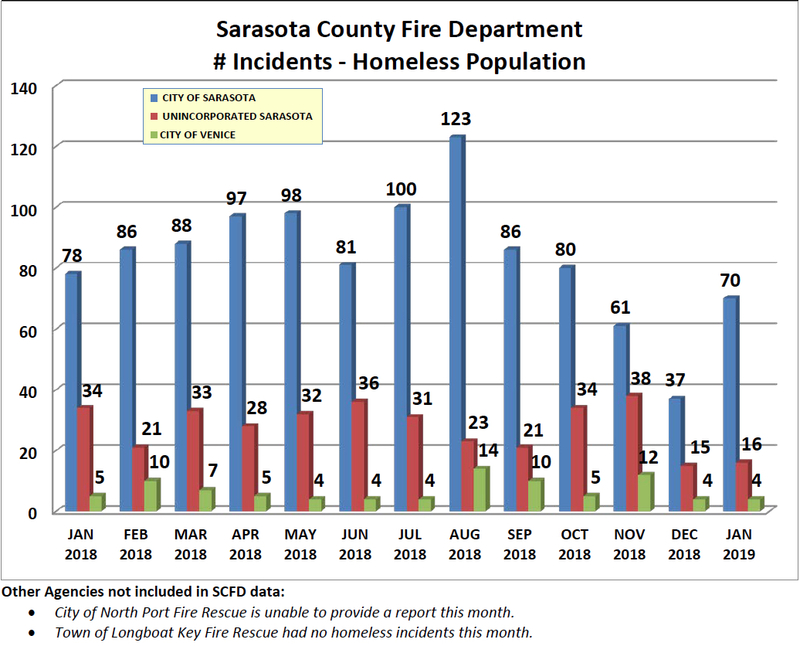 Knight also suggested that, because the Sarasota County Fire Department continues to respond to calls for help involving homeless people, and it transports them to medical facilities as needed, perhaps the opportunity exists for collaboration between the HOT program and the Fire Department. That might be one way to achieve efficiencies, he indicated, so funding would be available for expansion of the HOT program. The latest Fire Department report on transports involving the homeless population — for January — shows that 90 individuals received assistance, with 81 taken to a hospital. The highest percentage of the calls came from within the city of Sarasota (70), followed by 16 in the unincorporated part of the county. The total was down 23.1% compared to the figure for January 2018, the report said. The 81 transports in January of this year represented 1.2% of the Fire Department’s total for that month, the report noted. “I think the biggest thing,” Knight told the board on Feb. 26, “is that we have used the [Quality of Life] ordinance to effect.” Most of the time, he added, the team is able to persuade people to accept help, so the individuals are not arrested. Hines added that he recently has not heard complaints about problems related to the homeless population. “Thank you for working with us,” he told Knight.